Kyrie Irving led the league in the first several games of the season. With a mere 3.7 seconds remaining in the fourth quarter, Kyrie Irving drained his second free-throw, effectively ending the game. The Boston Celtics prevailed over the Oklahoma City Thunder 101-94, the Celtics’ seventh consecutive victory and a miraculous turnaround after being down 55-37 at the half. The Celtics are now 7-2, the best record in the NBA. After acquiring All-Star swingman Gordon Hayward and All-Star point guard Irving over the offseason, along with this year’s number three draft pick in Jayson Tatum, this seemed the start fans were promised.On the surface, however, that could not be further from the truth. Five minutes and 10 seconds into the first game of the 2017-18 NBA season, the ball was in the air. It was a routine alley-oop from Irving to Hayward, no different from the type of play Hayward had perfected as a member of the Utah Jazz. However, Hayward went down. This time, however, he did not bounce right back up; he broke his leg. In suffering one of the most gruesome injuries in NBA history, Hayward changed the NBA landscape. Having just reunited with Celtics coach Brad Stevens, who he had played under at Butler University, Hayward was set to be the centerpiece of the new-look Celtics. How could a team go from losing arguably its best player to owning the best record in the NBA in the short span of nine games? While there’s no way to definitively pinpoint the precise reason for this remarkable turnaround, Boston’s defense at this point in the season has been nothing short of sublime. The Celtics currently have a league-leading team defensive rating of 95.6. Beyond that, Boston’s starters rank first (Al Horford), second (Kyrie Irving), third (Jaylen Brown), fifth (Jayson Tatum) and 17th (Aron Baynes) in the league in defensive win-shares. No active Celtics player ranked within the top 30 last year. That is, no active Celtics player besides Hayward, who ranked seventh in the league. These win-share totals by Boston’s five best players are not, however, unprecedented. In fact, last year’s Golden State Warriors had players ranked first (Draymond Green), third (Stephen Curry), fourth (Klay Thompson), 10th (Kevin Durant) and 13th (Andre Iguodala) in the exact same statistical category. That Warriors team went on to win the NBA championship on the back of a 16-1 playoff run. Kyrie Irving is great defender. 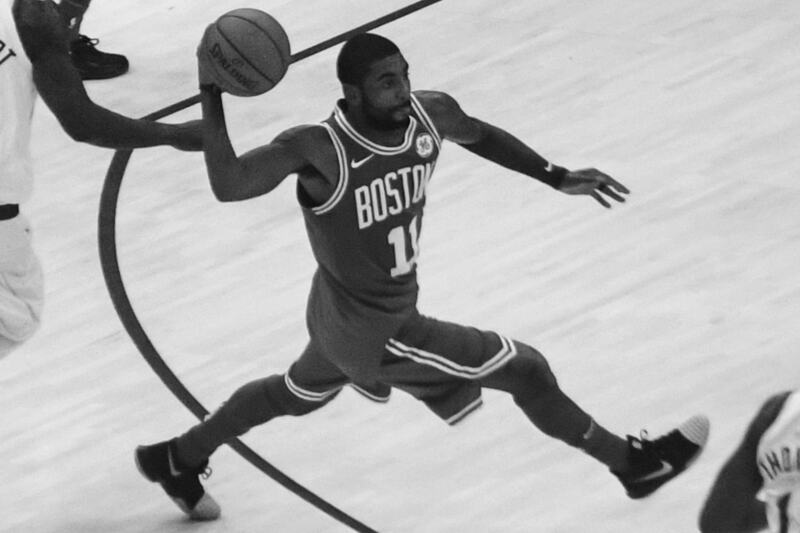 A 6’1” point guard with a 6’4” wingspan, Kyrie is not your prototypical basketball defensive-stopper. While he does have quick hands, Kyrie had lacked many tools of a top defender, most notably any semblance of effort on the defensive end. That’s the old Kyrie. No, Kyrie did not grow taller or longer over the offseason, but he did, upon request, get traded from the Cavaliers to the Celtics. The difference in effort is palpable. Hustle statistics are a great way to display effort not normally reflected in traditional statistics. Of note, Kyrie is second in the league in terms of total deflections (36) and eighth in loose balls recovered (13). On the flashier end of defensive statistics, Kyrie also leads the league in total steals (23). The Celtics will not win an NBA title this year. Yes, the Celticss have performed brilliantly over the past few weeks, but the Warriors are a deeper team. You may argue that the Celtics have been incredibly productive in the second halves of games, citing the contest against the Thunder as a strong example, whereas the Warriors have blown a few too many late leads. These blown leads are more an indicator of conditioning, however, and the Warriors will be considerably fitter by postseason. Furthermore, during the offseason, the Warriors added marksmen Nick Young and Omri Casspi as well as Jordan Bell, a rookie out of Oregon with exceptional physical tools that have manifested into tough defense and offensive flair. Hayward’s injury is the best thing that could have happened to the 2018-19 Celtics. No, I did not forget that it is still the 2017-18 NBA season. Hayward’s injury has accelerated the development of sophomore Jaylen Brown and rookie Jayson Tatum, and these two young players are bearing almost unfathomable burdens for their levels of experience. Look at Tatum’s game against the Thunder. With Irving an abysmal 1-9 from the field in the first half and Horford seemingly invisible, Tatum was forced to step up and keep the Celtics, albeit remotely, in the game. The likelihood of Hayward, Irving and Horford simultaneously shutting down for an entire half is infinitesimal, but this Celtics team no longer has Hayward. Jayson Tatum will not be the Rookie of the Year. His play and adjustment to the league has more than justified Danny Ainge’s choice to trade away the number one pick in the draft and pick up Tatum at three over Josh Jackson, the consensus third best player in the draft at the time. This year’s draft class is one of the deepest ever, yet the Rookie of the Year will be Ben Simmons, who was drafted with the first overall pick in June of 2016 and missed the entirety of last season due to injury. It’s simply impossible to deny Simmons’s near-triple-double season average. All of this success has not stopped Celtics fans from asking “what if” questions regarding Hayward. If anything, it’s increased the number of these questions. So far, the Celtics have played remarkably well in the 2017-18 NBA season, and they will be exceptional in the 2018-19 campaign as well. Indeed, if players could only shoot from a seated position during the upcoming 2018-19 NBA season, I’m confident Gordon Hayward would claim MVP honors. If you don’t believe me, watch some videos of him sitting in a chair at the Celtics practice facility, receiving and distributing passes while drilling shots. No other NBA player will get this kind of in-chair practice during the next several months. Note: Statistics reflect the first nine games of the NBA season in accordance to what was available when the article was written. Given the difference in teams’ schedules, this method was the only way to ensure all players (and teams) had an equal amount of season experience. The Celtics now have the league’s best record at 13-2, wining games against the Charlotte Hornets and the Toronto Raptors without point guard Kyrie Irving.